Order Noctiluca through our website today! Under the glow of pale moonlight, the waves of the cove steadily crash into the shore. Bright lights ripple across the surface of the water, glowing more with each passing wave. The mysterious noctiluca float to the surface, filling the inlet for just a few nights a year. We’re so excited to share this beautiful game from acclaimed designer Shem Phillips. We can’t wait to get this into the hands of our fans. 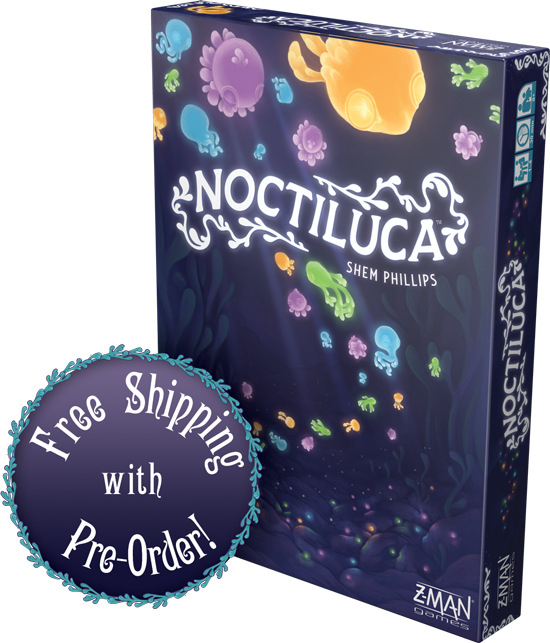 With a little behind the scenes magic, pre-orders of Noctiluca through our webstore will now have FREE* shipping! *Free shipping is available to US customers within the 48 contiguous states. 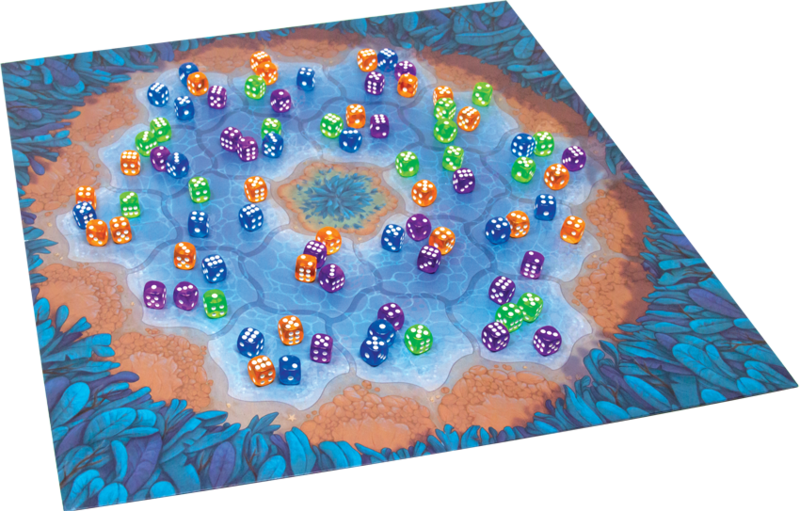 Represented by 104 colorful dice, the noctiluca will fill your game board. The colorful noctiluca can cure numerous ailments merely with their glowing presence. Healers from around the world will reward skilled divers who can catch these rare creatures. On each of your turns, you must strategically choose how you will dive into the pool. Once you select which edge of the shore you’ll dive in from, you’ll select a number and collect all of the noctiluca dice showing that number. The many different noctiluca can live in harmony with each other in carefully-tended jars. 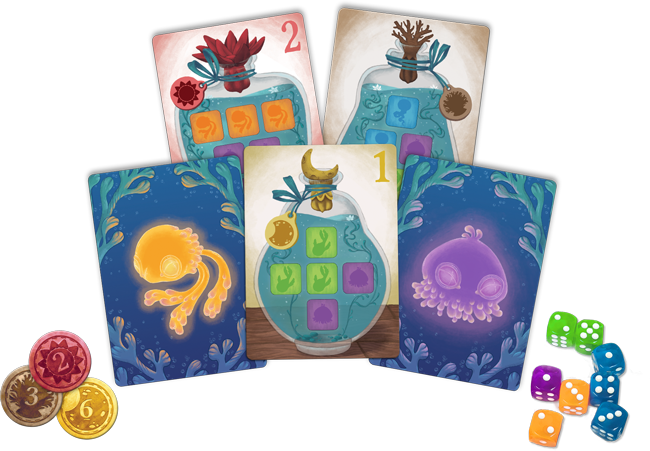 Once you finish your dive and pull the noctiluca dice off the board, you’ll place as many of the noctiluca as you can in the jars in front of you. Any noctiluca that can’t fit in your jar are passed to the next player. Plan your path carefully, dive into the waves, collect the noctiluca, and deliver jars to earn rewards! For the full rulebook, click here. 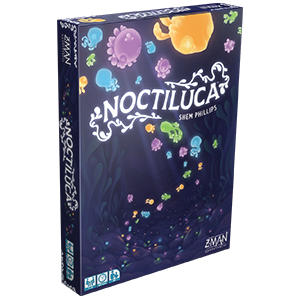 Noctiluca is a quick, fun game for 1-4 players. With gorgeous components, this is a must-have for every gamer’s library. Make sure to jump on the free shipping pre-order bonus to grab your copy!